Last weekend, about 40,000 gamers descended upon downtown Seattle for the fifth annual Penny Arcade Expo, held at the four-story Washington State Convention and Trade Center. They waited by the thousands in long, snaking lines for events like the finale of the Omegathon, PAX's gladiatorial gaming tournament. They packed into tiny conference rooms to hear media and industry panelists debate. And they swarmed the expo's exhibit hall in search of swag and hands-on time with upcoming games. Despite the Center's 200,000 square feet of space, for late Friday and much of Saturday it barely seemed to contain the masses. This was despite the fact that, unlike last year, the Expo's sizable tabletop component was relegated to the three-story annex across the street. Even with more space, more events, and more activities, PAX was often a very busy place. PAX's attendees were a diverse bunch. Though the average PAXgoer was probably male and in his 20s, gamers of both genders and all ages were well-represented. 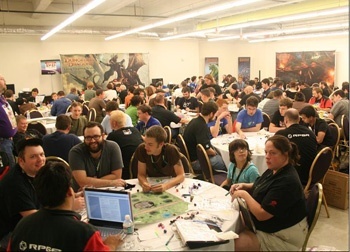 Whether due to Seattle's cool weather, the expo center's air circulation, or the overall hygiene practices of the attendees, the legendary "gamer funk" odor that reportedly accompanies festivals like GenCon was practically nonexistent. PAX also featured less cosplay than you'd expect for a gaming convention. Though I did see a couple of Pac-Mans, a Pikachu, and a Darth Vader with a pair of Stormtroopers in tow, most of the costumed attendees were paid folks decked out at the exhibit hall booths. I couldn't help noticing, in the midst of PAX's lines and crowds, how incredibly chilled-out and good-natured everyone was. You wouldn't suspect it from hanging out on Xbox Live, or from the long-held stereotype of gamers as maladjusted loners, but gamers are remarkably patient and laid-back among their own kind. PAX has to be the least unruly social event I've ever attended. Maybe it's because PAX is truly social. It's not just a massive gathering of like-minded individuals. It's a chance for gamers to get together and play. Though the show floor, panels, and exhibitions were huge draws, they were in many cases ancillary to good-old-fashioned gaming. Much of the expo's meeting room space was occupied by console freeplay rooms, where attendees gathered around LCD screens to play their choice of hundreds of games, from 8-bit era classics to the current generation's titles. They draped themselves across dozens of beanbag chairs in the handheld lounge, cradling their portable devices. Makeshift Rock Band stages appeared in hallways and lobbies. On the uppermost floor, a massive sea of monitors filled the PC freeplay and tournament rooms.